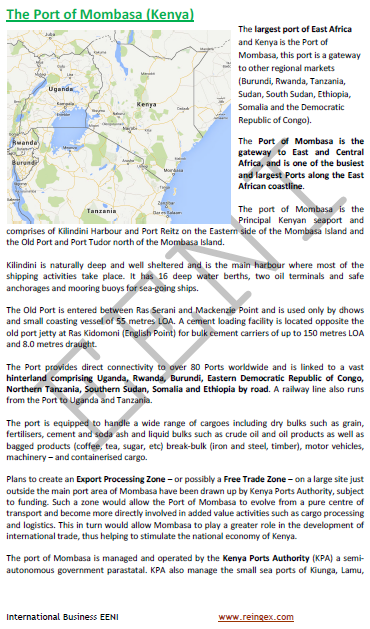 Syllabus of the Online Course (Subject) - Port of Mombasa (Kenya): The largest East African port. Description of the Online Course: Port of Mombasa (Kenya). The Port of Mombasa is the largest port in East Africa and Kenya; this port is a gateway to other regional markets: Burundi, Rwanda, Tanzania, Sudan, South Sudan, Ethiopia, Somalia, and the Democratic Republic of Congo. Other Kenyan ports are Kiunga, Lamu, Malindi, Kilifi, Mtwapa, Funzi, Shimoni, and Vanga. Yemen. Aden: 1,615. Al Mukalla: 1,436. The Port of Mombasa belongs to East African Economic Area (African Civilisation).